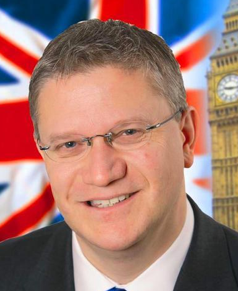 Andrew Rosindell is the Conservative Member of Parliament for Romford. He is proud to have been born and educated in his constituency and has devoted the majority of his working life to his area. It was in Romford that he first became Chairman of the local Young Conservatives aged 16, before going on to serve as a local councillor in Havering in 1990. By 1998 he was winning the highest Conservative vote share in London, at 88%. In similar style, Andrew was elected to the House of Commons in 2001 with the highest vote swing to the Conservatives of that election; he won by 5,977 votes, defeating the Labour incumbent, Eileen Gordon M.P. in an 11.4% swing to the Conservatives. This made Romford the first seat won by the Conservatives after the Labour landslide of 1997. Andrew’s appointment as Vice–Chairman of the Conservative Party soon followed in 2004, as did a position as Shadow Minister for Animal Welfare in 2007. More recently, in 2017, Andrew achieved his highest majority so far, winning his fifth election by 13,778 votes, and gaining 60% of the overall vote. Famously one of Westminster’s most patriotic MPs, Andrew was a passionate and vocal campaigner for Britain’s exit from the European Union. He takes a special interest in St. George’s Day and has campaigned for it to be a national holiday with celebrations along the lines of those held on national holidays in Ireland and Australia. In his capacity as Chairman of the Houses of Parliament Flags and Heraldry Committee, in 2010 Andrew successfully campaigned for a large Union Flag to be flown every day above the Houses of Parliament (from Victoria Tower), to replace a much smaller flag which had only been flown periodically, when parliament was in session; he feels, as many others do, that the flag should always be seen to fly proudly above one of London’s most famous national landmarks. Andrew maintains an active interest in foreign affairs and is the longest-standing member of the Foreign Affairs Select Committee, having been re-elected 3 times since 2010. His foreign interests also extend to chairmanship of a number of national and regional All-Party Parliamentary Groups, including those for Australia and New Zealand, Canada, British Central America, Switzerland, the Channel Islands, the British Overseas Territories, the Isle of Man, Liechtenstein, Monserrat, and the Commonwealth. Andrew is also a governor of the Westminster Foundation for Democracy, which works with emerging democracies to help them on their path to free and fair elections, and more stable national institutions. Most recently, in 2017, Andrew was also elected Chair of the British-Irish Parliamentary assembly, which promotes political co-operation and dialogue between Britain and Ireland.